Quebec is a land of contradictions: Harsh and polar winters with humid, stifling summers. Not everybody has the luxury of an air conditioner, whether for ecological, economic or other reasons. If you are one of those who spend the warm months without air conditioning, follow our advice to survive the heatwave and keep your home nice and cool! Unless you are lucky enough to get an exceptionally cool breeze, close your windows to keep the heat of the sun and smog outside. To ventilate, open the windows at bedtime, but don't forget to close them back in the morning. For more efficiency, move your fans to get more air flow. Close the curtains to stop the sun from shining through. A little tip: Dampen your curtains. The heat will evaporate the water, refreshing the atmosphere in the process. For your next decoration project, consider replacing your curtains for light-toned models that will reflect light, or installing shutters. In the meantime, you can buy sunshades like those that some people use their windshields: These large aluminum sheets reflect light outside. Use the microwave, barbecue or slow cooker to cook... or prepare meals that require no cooking at all. Wash clothes in cold water and let them dry on the clothesline. Ventilate the kitchen when using the dishwasher. Operate home appliances like the dishwasher at night, when it's cooler. Unplug appliances you do not need to use at the moment. Look for devices with the Energy Star symbol. Replace your incandescent bulbs with compact fluorescent light bulbs, which emit less heat. Yes, there are rules behind effective airing! Not only can you change the way you use your fans, but there are many tricks to help the air flow and cool your home during heat waves. 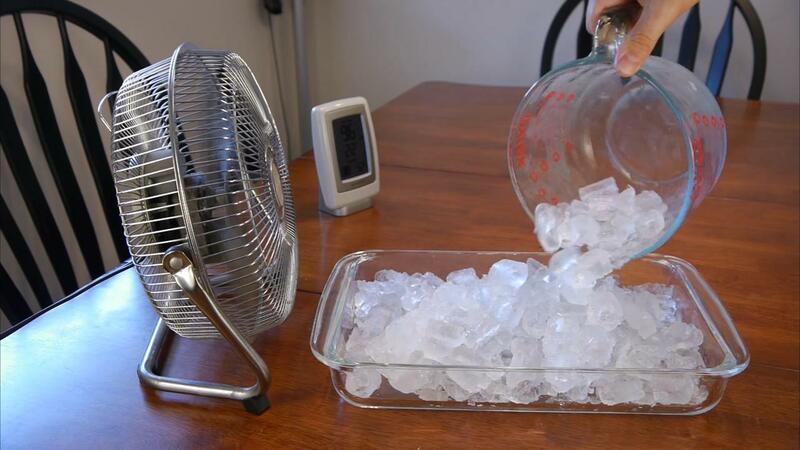 Create a home air conditioning system by placing a bowl filled with ice cubes, frozen water bottles, or a cloth soaked with ice water in front of the fan's air jet, whose temperature will drop immediately. Turn on all ventilation systems in your home, such as the air exchanger, the bathroom fan and the hood fan. Use your ceiling fans, which create a lot of air movement. In addition, consider changing their direction counter-clockwise. At night, set a fan facing inside infront of a window where the wind blows, and another facing outside by a window on the opposite side. This will allow you to make the most of the breeze. You can also open a window north of the upper floor of your house and another on the south side of the lower floor, which will create a chimney effect. Direct the fans up rather than directly at you. Open the door to the basement and use a fan to blow the cool air in the rest of the house. A heat wave is definitely no time for intensive gardening, but when time comes to design your garden for next year, keep the warm days to come in mind and be strategic! First, have you heard of green roofs? It literally means to grow plants on the roof, after layers of soil, filter cloth, drainage layer, root barrier and waterproof membrane. This arrangement helps to save on electricity in winter and summer, when it keeps the roof temperature between 15 and 20 degrees Celsius, versus 65 and 80 for regular roofs. That said, this requires a lot of work and money... For those who do not have this option, there are other solutions such as easy-to-maintain climbing plants that form a protective coating against the sun. Even if it will take years before you can enjoy their shading, trees are great investments in the long term, and hedges cool the air by evaporating water from the ground. Take several steps to protect yourself from excessive heat, which should be taken seriously: heat stroke can be fatal, especially for vulnerable individuals such as the elderly. Symptoms of heat stroke and hyperthermia are nausea, vomiting, excessive fatigue, muscle cramps and stiffness, dizziness, headache, high pulse and difficult breathing. Eat foods that hold a lot of water, such as watermelon and cucumber. Eat normally, even if you are not hungry. Eat spicy food, which will make you sweat! Spray your face regularly with a thermal water mist, sold in the cosmetics section of the pharmacy. Keep a damp towel in the fridge to sponge yourself. Wear light and pale clothing, preferably natural fabrics such as linen or cotton. Make your bed with cotton sheets (you can put them in the freezer a few hours before bedtime). Apply ice cubes to your body's pulse points, such as your wrists and the back of your knees. Soak your feet into a bowl of ice water. Take cool showers and baths. Swim as often as possible. Spend time in air-conditioned places (cinema, library, shopping center...). Avoid physical activity, especially outdoors. No air conditioning? No problem! 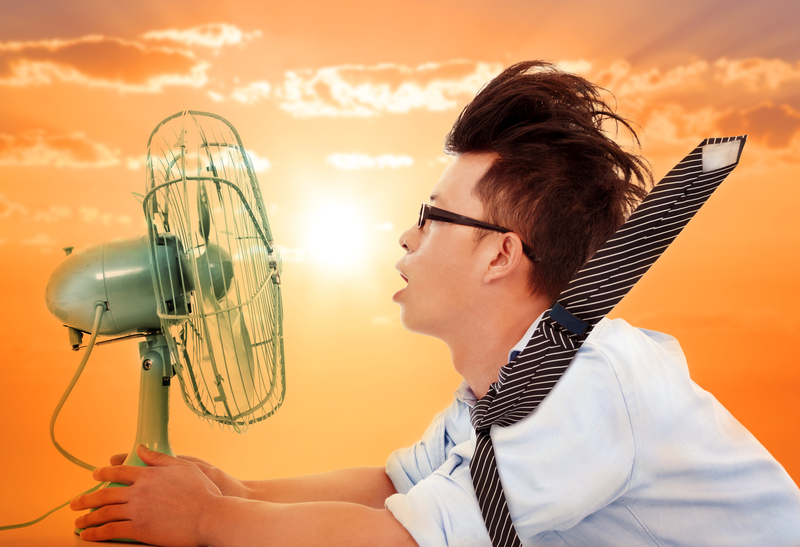 Learn how to stay cool at home when it's just too hot.